Some kids don’t see as well as others — it’s just a fact of life. However, you don’t have to assume that glasses are the only option for your child. Of course, it’s hard to decide whether your child is ready for contacts, so here are five questions you should ask. Does Your Child Get Bullied or Have Self-Esteem Issues Because of Glasses? Unfortunately, kids get bullied when they look or act differently. That’s why being teased for wearing glasses is so common. Some kids are able to handle the teasing with grace, while others get self-esteem issues. So, if your child is getting bullied or having issues with his or her self-image, it may be time to consider contacts as a solution. Of course, getting contacts for pure vanity reasons isn’t a good idea, so you have to consider all of the factors. 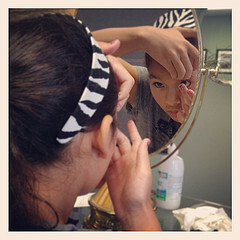 Is Your Child Responsible Enough to Care for Contacts Themselves? The most important thing to consider before getting your child contacts is whether he or she is responsible enough to handle them. Age isn’t really the deciding factor, either. Some teenagers aren’t responsible enough while some preteens don’t have any issues at all. Good things to look at are whether or not your child can keep his or her room clean or take care of a pet. Has Your Child Been Asking for Contacts? One good indication that your child is ready for contacts is if he or she has been asking for them. If you're being bugged about contacts, that means your child is not afraid to use them. Many parents hold their children back because they don’t want to be inconvenienced, but taking care of contacts really isn't that bad. Plus, you can order contacts online. If your child wants contacts, it may be time to start looking into them. Does Your Child Play Sports or Do Other Activities Where Glasses Get in the Way? You should also look at your child’s lifestyle when deciding whether to buy contacts or not. Kids who are very active and play sports usually do better with contacts because glasses can get in the way. As a matter of fact, glasses can actually be a danger to kids during sports because the lenses can break and get in the eyes or injure the face. However, children that just wear glasses occasionally for reading probably aren’t good candidates for contacts. Would Your Child’s Eyesight Be Treated Better with Contacts? Several eye conditions can improve with the use of contacts. For instance, some studies show that if you fit your child with contacts, it slows the progression of Myopia. There are also contacts that can change the shape of the cornea and improve a child’s eyesight, in addition to black-out contacts that help children correct amblyopia. This is when the benefits always outweigh the cons. You need to work with an optometrist to decide on the best option for your child. However, do you have any other advice for parents when they are deciding whether to buy contacts for their child or not? This is a guest post. For more information please check my Disclosure Statement. I think having the option for children to get contacts is a good one. Some kids are responsible enough to handle them and it does help if they are having self image issues. As the kid grow, so is the amount of grade and vision also varies. Contacts are expensive though and some kids like to have them for just an accessory. It's important for the parent to supervise what their child needs. My oldest son wears contacts. He had glasses forever and his eyes never got better even with therapy. I had the doctor change him to contacts, he always wore his glasses down so he was not really using them. The contacts made such an improvement. Love that the doctors are listening to us now. Our 10 year old son wears glasses and our 15 year old daughter wears contacts. But, I needed to make sure that she is responsible enough to take care of her contacts before I agreed that she gets contacts. She said she is more comfortable with contacts that with glasses. I used contacts for a while when I was in college but did not like it so am back to eye glasses. Very informative post! I have no idea, on which one should I do since we don't have member who wears an eyeglass in the family.. Contacts can get expensive but if a child can not keep up with their glasses or breaks them easily than I think that may be the way to go. I personally did not get contacts until I was 16, but I think if the child is comfortable they should give contacts a try at least!